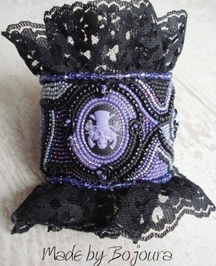 Let me show you one of the most fun themed beading contests I’ve seen in awhile: The Gothic Beading Contest organized by Trudy of the Black Crow Dutch Beadwork forum. Trudy loves black (don’t we all!) 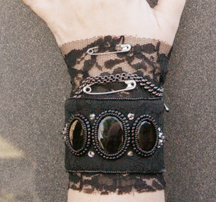 and Gothic themes, so she inspired others to get creative within those very broad guidelines. 13 bead artists participated in the cuff category and 9 in the choker/necklace category. The forum used an international independent jury so moderators or owners were free to participate.Their list of sponsors is too long to include here, but many are from the USA, including me. I’ve shown you a few photos, but you must go look at all the entries – they are quite creative and fun. Trudy did a fantastic job putting this together, and organizing sponsors. Makes me wish I were Dutch! Wonderful! Thanks for sharing. Just one question; why do you wish you were Dutch? 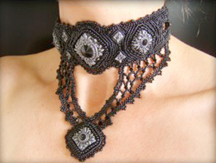 The Gothic contest was in the Netherlands for Dutch beaders… I could have entered if I were Dutch! « I’m Giving Away My Bead Weaving Patterns!